I haven't really looked at one up close, but I remember chipping in for one of those running strollers for a baby shower, and I think they're super smooth for that exact reason. Probably better shock protection than roller blades. I never thought about that--the baby stealing. Ha! Eric, you shouldn't be stealing babies. 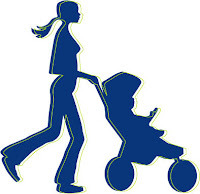 Eric, are you looking for excuses to run slower than moms pushing babies? but I think you'd look funny in a purple matching velour jump suit and blonde pony tail though. Oh and have you seen the wheels on those things? They are made for all terrain cross country touring I think. They are nicer than the wheels on my corrolla. That baby isn't feeling a thing except embarrassment. I take my kids jogging and their favorite part is when I go off-road. They like the bumpy gravel and in unison they let out a monotone, "ahhhhhhhhhhhhh." then laugh. i guess kids is different than babies? how old of kids do you put in that thing? OH Eric, only you:)! As soon as G started speaking himself some English, well have to ask him!